HOW DO TOWING KITS WORK? This is a Basic Tow kit that is offered all over the USA by our Competitors, because it is a one size fits all, and is not suited for most customers. It is a small 6.00" #2500 bag that takes far too much psi to lift, resulting in a very rough ride. You should MAKE ROOM for the largest diameter bag possible, and this means you should install the $399 INBOARD kit that bolts onto the axle. You may have to relocate exhaust or shock absorbers on some vehicles, but it will be worth it. Most customers think that if they put air springs on their truck, it will ride smoother. THIS IS NOT TRUE. It will ride rougher because the Air Spring exerts pressure on the leaf springs and increases the tension. When you install any Air Spring, you should REMOVE the overload springs and even a leaf or two to soften up the ride. Our larger bags are 7.25” in Diameter and have 2” more travel. This kit uses either a 7.25" DeNominator-II bag which is 2" taller than our #2600 bag or even up to a #3800 8.50" bag, depending on available room. It mounts INSIDE the frame and over the axle. Sometimes you have to move the exhaust and/or the shock mount to make room for the bag, Now it takes only 30psi to lift instead of 120psi, and rides smooth. Be SURE to remove overloads and even an extra leaf or two. 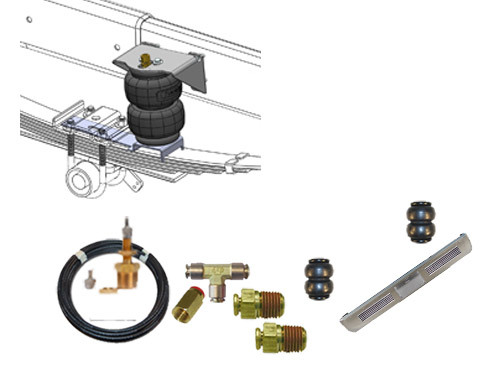 Tow kits are generally installed wrong by Installers and cause a rough ride. Air Springs take the place of your overload springs, so this means that YOU MUST REMOVE OVERLOADS !! In many cases, you will want to remove an additional leaf, or even 2 or 3. Leave at least a minimum of 3 leafs on your spring.for full size trucks, or 2 for mini trucks. Generally, Dually kits are mounted outside the Frame Rails (between the frame and the tire, and there is not enough room for a larger bags in most cases. In this case, you can specify a BUMPSTOP REPLACEMENT TOWING KIT. It will mount inboard and allow you to use a larger bag. You will need to weld the brackets in place. If you add Air Springs and do not remove your spring pack, your vehicle will ride ROUGHER, not Smoother because all you are doing is building extra pressure on the spring to lift. Before buying, measure the maximum space you have available and always order the largest bag you c an fit without rubbing. Most Competitor's kits come with a one size fits all #2500 6.25" diameter bag. This is wrong. The larger the diameter, the smooooother... the ride. a #2600 bag requires 7.25" in the clear. A #3800 bag requires 8.50" in the clear. Here is what Jeff Randol from Greeley, Colorado, just one of our many pleased customers, is saying about OUR new Air Spring Suspension Tow Kit!!! - Here's one I wouldn't have thought of: the truck is quieter! Less road noise. The truck was tight before (no squeaks or rattles) but there is definitely less road noise now. I guess if you think about it, metal on metal (spring on frame) wouldn't leave anything in there to dampen road vibrations. The Air bags must act as a sound dampener? By how much of a difference I'm not too sure, I'll need to compare against same truck w/ stock suspension, but I'm sure it's quieter. - No lunging under heavy braking. I had to brake pretty hard and fast on the highway today. I noticed the nose didn't drop like it would with the stock springs on there-very cool! All in all very happy with it! Do you have an FTP folder upload the video too? I have 1.3gb (compressed) of video during the build. Also, can I somehow get the video you guys took of the completed build?